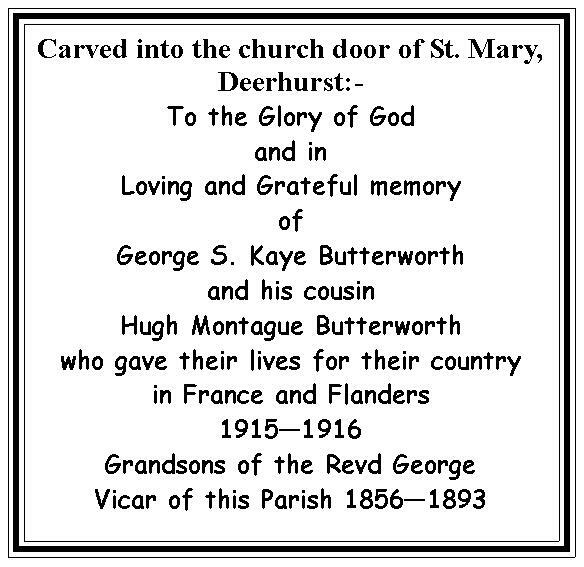 George Butterworth was the Vicar of Deerhurst from 1856 to 1893. He was born at Clapham Common in London in 1822. Described as a “scholarly man” as well as a “dedicated clergyman”, he moved into the parish with his wife when he secured the appointment of vicar. His wife’s father was Bishop Kaye, Bishop of Lincoln. Butterworth had always suspected, from the great thickness of its walls, that the central portion of Abbots Court was very old, but had not discovered anything to indicate its age. George Butterworth wrote the first edition of his book “Deerhurst. A Parish in the Vale of Gloucester” in 1887, after he had lived and worked in the village for over 30 years. Much of the book concerns the history of the priory church, but he also discusses at some length the other major buildings and important families of the parish, folklore, customs and flora and fauna. The book was the result of a great deal of historical research and personal observation, and illustrated Butterworth’s love and care for the priory church and for its fascinating historical background, and for the history and folklore of the whole parish. In 1885 when work was being carried out on the building, Revd Butterworth took a look inside and he noticed a faint semi-circle under the plaster covering the front wall. He removed some of this covering and exposed the remains of a round headed doorway. Gradually, Revd Butterworth and builder Thomas Collins revealed a Saxon chapel. The walls of the chapel had been plastered, covering the windows. When the restoration was complete the chapel was found to consist of a nave and chancel of a total length of 46ft, divided by an 11th century arch. Sir Alexander Butterworth, one of Revd George Butterworth’s sons, became a solicitor and later General Manager of the North Eastern Railway, based at York. His son George Sainton Kaye Butterworth (born 1885) was a talented composer, writing three orchestral works Two English Idylls (1911), A Shropshire Lad (1912) and Banks of Green Willow (1913), as well as songs and choral music and several arrangements of Morris dance tunes. In World War 1 he won the Military Cross for his defence of a trench which was subsequently named after him. He was killed by a sniper’s bullet during the Battle of the Somme in 1916. His memorial is at Thiepval.